The SNES entries to the Final Fantasy saga must have had some spare Phoenix Downs, because they're coming back to life in three new soundtracks. The Final Fantasy franchise is responsible for some of the most recognizable tunes in gaming, thanks to the series' long-time composer Nobuo Uematsu. In tribute to the soundtracks of the Super Nintendo-era Final Fantasy games, Square Enix is working on a set of three nostalgia-packed remastered soundtracks. Each of the SNES entries to the series - Final Fantasy IV, V and VI - will be getting a CD's worth of freshly resurrected tunes, starting this summer. The first game soundtrack to receive a remastering will be Final Fantasy IV, with few details on the others as of yet. The remastered Final Fantasy IV album will feature several memorable tracks from the age of the Super Famicom, including "The Red Wings," "The Theme of Love," and "Battle with Golbez's Four Fiends." Print copies of the CD will have special cover art by character designer Yoshitaka Amano. The CD is only slated for a Japanese release, though it's very possible that Square Enix will release a digital version for Western consumption given their track record for soundtrack releases in the past. 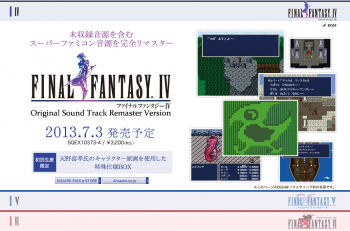 The remastered Final Fantasy IV soundtrack is scheduled for a July 3 release in Japan, with V and VI to follow. There's a lot of nostalgia at play here, but the music from these games is certainly worth remembering. Who knows, the sweeping orchestras and experimental compositions might even grab the attention of these darned kids and their wubstep craze.